Preparing to surf big waves is as much about feeling physically strong as it is about feeling mentally ready. 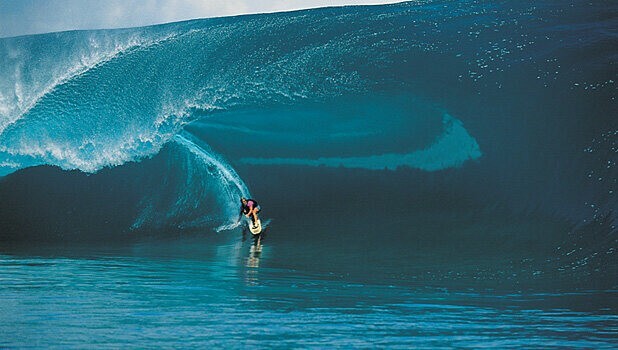 Understanding what challenges you, what excites you and ultimately what kind of risks you are prepared to take will allow you to clearly see the possibilities of riding big waves. Think of a time when you have felt a bit “toey” before paddling out into threatening waves. That uncomfortable, excited feeling of “not knowing”. The mind is racing, going through possible scenarios that haven’t even occurred yet. But, once you’re out there and have successfully hooked into your first wave…the pressure eases a little and you’ve never felt more sharply alive in your life. In general, the thinking mind interferes a lot when it comes to human potential. Over thinking can paralyse you, especially in sporting performance. We’ve all heard of athletes talk about being in “the zone” during times of individual brilliance. Reports of not recalling clearly what happened are common. This hazy recollection of “zone time” is largely due to an absence of thought. Very little, if any, interference of mind occurs. The individual is totally present to what is occurring moment to moment and is creating and responding to situations as they arise. A way of describing this is “present moment awareness”. For many of us, we only enter this state during times of great physical challenge. Jumping out of a plane, climbing a rock face, riding a huge wave. The reason “presence” occurs during these situations is that past and future are of no assistance to what’s happening in that moment. Lets use a surfing example; As you stroke into the biggest wave of your life, if your mind wanders to the future eg “If I don’t make this drop I’m in serious trouble” then straight away two things have happened. Firstly, your thinking mind has interfered and created doubt, and secondly, thoughts associated with what’s going to happen next (future) are taking away from what’s happening right now! And what’s happening right now is, I need to get to my feet cleanly and see what happens next. Do an experiment. For one day, notice how often your mind is occupied in either the future (maybe a problem you have to face tomorrow) or the past (maybe a difficult situation you had to deal with this morning). You’ll be shocked at how little, if at all, you are actually “present”.